A month-long event of the PCRA (Petroleum Conservation Research Association) ‘Saksham 2018’ will commence on the 16th January 2018 in a mega inaugural function to be held at Siri Fort Auditorium in New Delhi. The event is planned with various interactive programmes and activities with the campaign on fuel conservation. 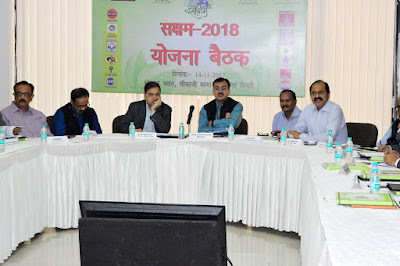 Saksham or the Sanrakshan Kshamta Mahotsav is an annual flagship event of PCRA (Petroleum Conservation Research Association). It comes under the Ministry of Petroleum & Natural Gas, with active involvement of the Oil & Gas PSUs along with other stakeholders like State Governments. The basic objective of this event is to create focused attention on fuel conservation through people-centric activities and to sensitize the masses about the conservation and efficient use of petroleum products leading to better health and environment. This month-long campaign aims to intensify the efforts to make the citizens aware of the effective utilization of petroleum products. PCRA will carry out various people-centric activities like Training Programs for Drivers / Fleet Operators, Fuel Efficient Driving Competitions, Group Talk with Ladies / Cooks / Maids / School / College Girls on fuel saving & benefits of LPG / PNG over biomass, Educational Programs for Schools / Colleges / Universities, Awareness Programs for Farmers, Walkathons, Concerts, Exhibitions, etc. Apart from these activities, PCRA has also planned to observe Cycle Day on 21st January throughout the country & Cyclothon event at Indore, Bhubaneswar, Mumbai etc. to spearhead the message of fuel conservation, reduction of vehicular emission by reducing congestion and improving traffic flow. Nationwide campaigns are planned for various cities on various media platforms through means of All India Radio, Doordarshan, TV channels, Private FM channels, Digital Cinema Theaters etc. on fuel conservation. An exhaustive coverage through social media across the country is also planned by PCRA during Saksham campaign including interactive contests through Facebook, twitter, MyGov platform etc.